We have listings for most possible combinations with plates, cutlery and cups. When you navigate through the categories and subcategories on the left hand side, you will easily find the listing to match your needs. 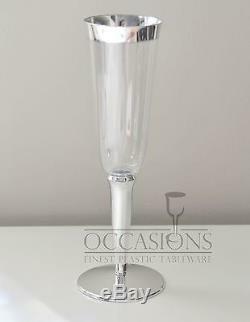 60/100/120/200/240 pcs Champagne Flutes - Clear Plastic with silver base and silver rim. Capacity 6oz, 9 inches tall (simple assembly required). 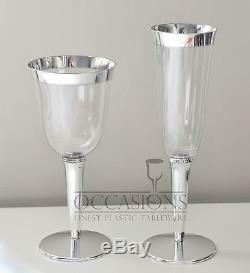 If you want to add equal qtty of our Silver rimmed wine cups, please choose the correct option upon placing the order. So for example to order 120 champagne cups and 120 wine cups, choose the option for 120pcs and then choose "yes" on the "add wine cups" option. These Wine cups are REAL size cups and look like real glasses. 7.5 oz capacity, 7 inches tall. (simple assembly required) Check the pictures to compare them with a real glass and to other popular cups you see on the market and see the difference. The item "Bulk, Wedding Disposable Plastic Champagne Flutes, Wine cups, silver rim glasses" is in sale since Thursday, May 1, 2014. This item is in the category "Home & Garden\Greeting Cards & Party Supply\Party Supplies\Party Tableware & Serveware". The seller is "occasionsbh" and is located in Miami, Florida. This item can be shipped to United States.